Featured Instagram Photo of the Month: A lush garden grows strong after a rainy January. One day it’s cold and rainy, the next it’s windy and dry. Then, all of a sudden, you’ve got a perfect, 75-degree day. Welcome to wintertime in Southern California! We’ve been lucky to have a wetter winter than we’ve seen in some time and hopefully, your garden is loving it! It's easy to take a break from the garden when your plants get regularly watered from above. Don’t get too comfortable, though. While your plants may be loving the wetter days, so are the weeds. It’s time starting cleaning things up and getting ready for spring. If you're in the market for plants, there will be a greenhouse fundraiser tomorrow, Saturday 2/2 (weather permitting). It’s also time to start planning what seeds you might want to start at home for your summer garden. You can still sow beets, carrots, cilantro, drill, endive, fennel, kale, kohlrabi, onions, peas, radishes and spinach. You can also think about starting some of your summer crops indoors. For a list of ornamentals to sow, you can visit the Gardening in LA blog. 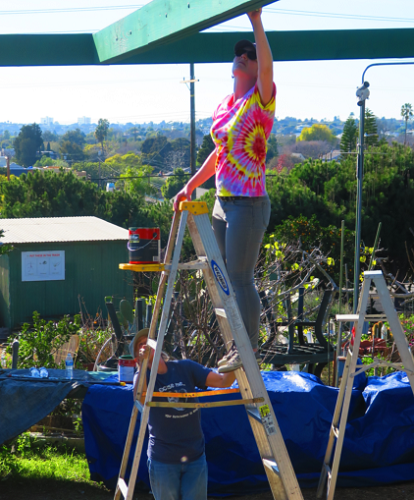 Aside for the greenhouse fundraiser scheduled for Saturday 2/2, there is also a free workshop at the Santa Monica Public Library's Fairview Branch on “Successful Seed Sowing for Spring Planting” with Sue Michiels of Renee’s Gardens. She will be sharing information on when and where to sow seeds and transplant seedlings outside for a successful spring garden. She also shares tips on sowing seeds indoors, how to use soil-less mixes, and how to use heating mats and lights to grow. We have the first Greenhouse Fundraiser of the year schedule for this Saturday 2/2 a noon. Greenhouse Keeper Nina Rumely took some time to highlight a few of the less-commonly grown plants offered at this month’s sale. 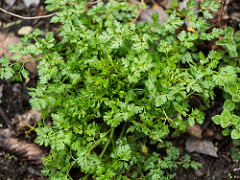 Chervil is one of my favorite cool season herbs and you've got to use it fresh as dried is no good. It's fabulous with asparagus, peas and delicate white fish like sole; nice to put in salad and scrambled eggs. 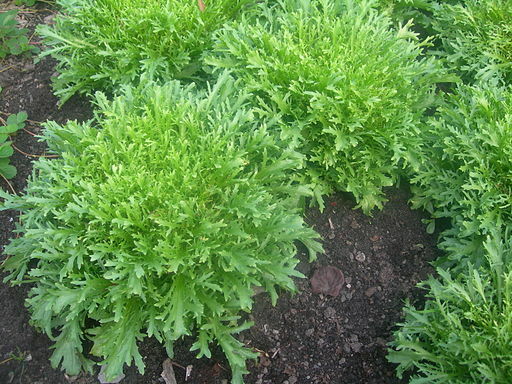 It likes partial shade and regular moisture. This link is British; some of Hugh's suggestions are great. Frisee a crisp-leaved, nutty tasting green. Lovely in a salad with butter lettuce or the classic French salad of lightly wilted frisee with bacon bits & a simple vinaigrette. Make sure you check the OVF website for a complete list of plants that will be available during the sale. Once again, one half of the Ocean View Farms Board of Director positions will be up for election on April 13, 2019 during the April General Meeting. As some of you in Upper Phase One already know, longtime phase rep Andrew Sacks will be stepping down from his position in April to devote more time to his young family, so if you think you’re up for the job (you do not have to have a plot in upper phase one), or any of the others listed, please contact OVF Election Coordinator Nora Dvosin. If you have any questions about serving on the OVF Board, or any other OVF leadership concerns, OVF President Frank Harris will once again be hosting two Pine Tree Chats this year. 11:00 Am – Noon, under the large pine tree in phase 1. In early January, work started on the new shade pavilion being installed over the general meeting area. 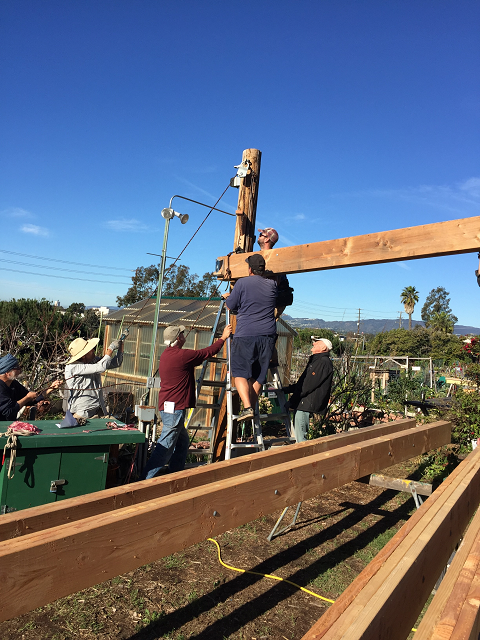 After fabricating the beams, a special work crew gathered on Saturday, January 19th to begin the initial phase of the project by raising and installing the beams on the four telephone poles that surround the meeting area. 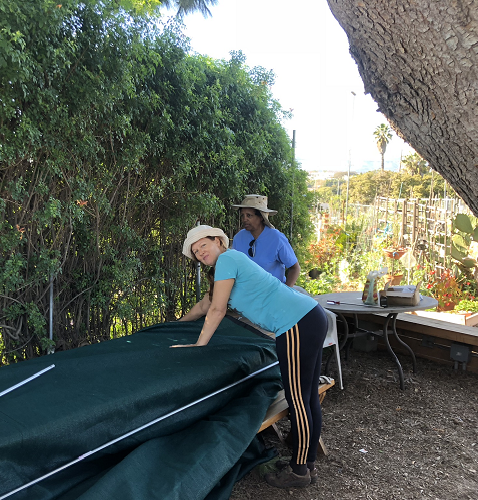 Phase One members Josephine Keys and Roman Ferede prepare the shade cloth that will retract over the new shade pavilion, also during the January Sunday workday. A very, very special thank you to garden members Fernando Atschul, Carlos Bracho, Alan Canterbury, William Clark, David Clayberg, Dean Cleverdon, Jay Felker, Mike Manaugh, Joseph Schlitt and Jason Wascho, who all truly volunteered, without being asked, some, or most, of their Saturday for this effort. OVF would also like to thank those that came to the Sunday Workday in January to also support the project (with sincerest apologies if your were there and your name is omitted): Naren Chaudhari, Dean Cleverdon, Scott Feldman, Roman Ferede, Patricia Harburg - Petrich, Josiah Hartzell, Katrina Johantgen, Josephine Keys, Ivka McKnight, Ronda Ross, Geneva Simmons and Carole Stein. We hope to have the project completed by the end of February, when three retractable shade panels will be installed inside the three bays of the existing structure. The dealines to submit your renewal fees is fast approaching. OVF Renewal Fees must be postmarked by this Saturday, February 2nd, 2019 or received via OVF Online Bill Pay by midnight PST, Thursday, February 7th, 2019. If you absolutely must submit your fees via mail, you can use the Bill Pay link above for more information. We had a situation the other day where the city would not pick up our green barrels because they had too much garden soil in them. I've also seen soil dumped behind the dumpster at the top of Phase 1. When the city wouldn't take our barrels, Jose did a great job jumping in with a shovel and a wheelbarrow to remove the soil and take it to the dumpster, but he should haven't to do that. If you have a problem with your soil or feel like you have too much soil for some reason, please contact me (Ed Mosman) for help dealing with the situation. Happy gardening!